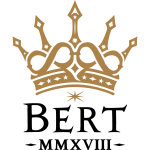 Classic logo commemorating the Queenbert 2018 tour. The crown contains symbols representing both parties and Australian and New Zealand flags. In glittery gold print.